"Speed remains a factor in nearly one-third of all traffic deaths in the U.S., with Massachusetts ranking 23rd among the states in speed-related deaths, according to a new report. The Governor’s Highway Safety Association, a nonprofit organization that studies traffic safety around the country, released the report, “Speeding Away from Zero: Rethinking a Forgotten Traffic Challenge,” on Tuesday and found that in Massachusetts, 28 percent of motor vehicle deaths in 2017 were speed-related. "Slow as molasses? This treacle didn’t trickle. It was a sticky, deadly tsunami that flattened an entire Boston neighborhood within seconds. The initial wave rose at least 25 feet high (7.6 meters high) — nearly as tall as an NFL goalpost — and it obliterated everything in its path, killing 21 people and injuring 150 others. Rivets popped like machine-gun fire. Elevated railway tracks buckled. Warehouses and firehouses were pushed around like game pieces on a Monopoly board. Tenements were reduced to kindling." 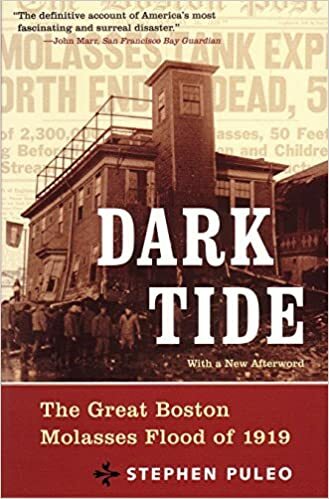 Have you read Dark Tide, Stephen Puleo's book on the Molasses Flood? The library has a number of copies available as part of the program this year (2008) "On the Same Page". The Senior Center is offering a talk by Dr. Gary Hylander on "The 100th Anniversary of Boston's Great Molasses Flood." This is scheduled for Wednesday, Jan 23 at 10:00 AM. Please call the Senior Center to sign up.